Many anthropometric measures, including body mass index (BMI), waist-to-hip ratio (WHR), and subcutaneous fat thickness, are used as indicators of nutritional status, fertility and predictors of future health outcomes. While BMI is currently the best available estimate of body adiposity, WHR and skinfold thickness at various sites (biceps, triceps, suprailiac, and subscapular) are used as indices of body fat distribution. Copy number variation (CNV) is an attractive emerging approach to the study of associations with various diseases. In this study, we investigated the dosage effect of genes in the CNV genome widely associated with fat distribution phenotypes in large cohorts. 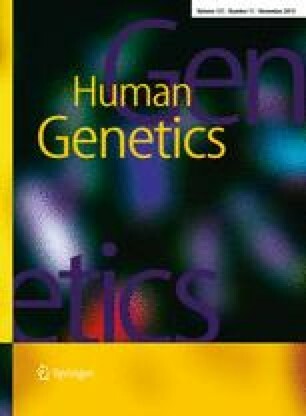 We used the Affymetrix genome-wide human SNP Array 5.0 data of 8,842 healthy unrelated adults in KARE cohorts and identified CNVs associated with BMI and fat distribution-related traits including WHR and subcutaneous skinfold thickness at suprailiac (SUP) and subscapular (SUB) sites. CNV segmentation of each chromosome was performed using Golden Helix SVS 7.0, and single regression analysis was used to identify CNVs associated with each phenotype. We found one CNV for BMI, 287 for WHR, 2,157 for SUP, and 2,102 for SUB at the 5 % significance level after Holm–Bonferroni correction. Genes included in the CNV were used for the analysis of functional annotations using the Database for Annotation, Visualization and Integrated Discovery (DAVID v6.7b) tool. Functional gene classification analysis identified five significant gene clusters (metallothionein, ATP-binding proteins, ribosomal proteins, kinesin family members, and zinc finger proteins) for SUP, three (keratin-associated proteins, zinc finger proteins, keratins) for SUB, and one (protamines) for WHR. BMI was excluded from this analysis because the entire structure of no gene was identified in the CNV. Based on the analysis of genes enriched in the clusters, the fat distribution traits of KARE cohorts were related to the fat redistribution associated with the aging process. In addition to structural variation, dosage effect analysis of genes based on CNV is useful to gain an understanding of the comprehensive biological phenomena underlying particular phenotypes and/or diseases. The online version of this article (doi: 10.1007/s00439-012-1203-1) contains supplementary material, which is available to authorized users. The large-scale genotyping data were supported by the Korea Association Resource (KARE) project, funded by the Korean National Institute of Health, Republic of Korea.